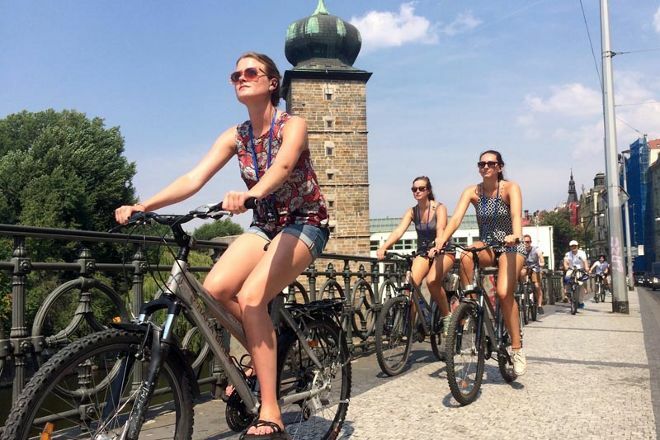 Informative and engaging tours with Praha Bike allow you to explore the city's highlights without wearing out your shoes. You can rent a range of bikes from this operator, including mountain and hybrid bikes, e-bikes, tandems, and a 6-seat team bike. City tours and excursions outside of Prague are offered in English, with other languages available with prior arrangement. Join a guided tour to sightsee with other tourists, or rent a bike and explore on your own with a map containing recommended trails and tour suggestions. Keep in mind, guided tours run every day between March 15 and November 15, but off-season tours are available by advanced reservation. To visit Praha Bike on your holiday in Prague, and find out what else Prague has to offer, use our Prague trip planner . We tried the Classic City tour (2.5 hrs) and had a great time! Such a great way to see lots of Prague while also receiving the historical context and significance of the sites. Francesco was a great tour guide. This tour allows you to get familiar with the city, see where you might want to visit and explore, and get local tips from the guides. It was 32 USD per person which felt a bit pricey but that included a water bottle and by the end of the tour we all felt that it was worth the money. I had a fantastic time on this bike tour!!!! Our tour guide was Francesco and he was awesome! He is passionate about his job and it makes for a really great experience. It was nice to be able to see the sights and throw in some excercise as well. (A lot better than sitting on a bus for 3 hours 🙄) The sights were amazing and he took us to some really neat parts of the city. Everyone I met at Praha Bike was very nice. Thanks so much for a wonderful experience!!! Took the panoramic bike tour on the 25th Apr, with a small group, Claire & Richard (New York) and Erin (tour guide). I sign up for the normal bike without knowing everyone else was on e-bike and the ride was a little bit hilly in some parts of the ride. Erin was very gentleman and kind to swap his E-bike with me. It was a relatively short and informative tour. The tour took me to the route that I didn’t manage to explore myself. And of course riding on bumpy cobblestone streets was great experience and great fun. With awesome tour guide, e-bike and breathtaking views, I will definitely do it again! We tried two other bike places before settling on praha bike. Our guide Micky was very good and kept us safe and well informed on the panoramic tour. The views and information we experienced were great. Our kids loved it and our youngest who hasn't ridden much in busy traffic before coped really well. The bikes were decent for the terrain. We'd do another tour on our next visit. We had a great time doing the Classic City Tour with Sergio (looking forward to the Mendelson answer! ;-) as our tour guide. The tour was fun, well-paced, and really enjoyable. Our kids (7 and 8) really loved the Tagalongs, which let all four of us enjoy biking around the city without worrying about cars or uneven cobbled streets. Highly recommend! Every day, we help thousands of travelers plan great vacations. Here are some tips on how to use your Listing Page to attract more travelers to your business - Praha Bike. Promote your permanent link - https://www.inspirock.com/czech-republic/prague/praha-bike-a942931869 - on your website, your blog, and social media. When a traveler builds a plan from this page, the itinerary automatically includes Praha Bike. This is a great way for travelers looking for a great vacation in your city or country to also experience Praha Bike. Promoting your link also lets your audience know that you are featured on a rapidly growing travel site. In addition, the more this page is used, the more we will promote Praha Bike to other Inspirock users. For best results, use the customized Trip Planning Widget for Praha Bike on your website. It has all the advantages mentioned above, plus users to your site can conveniently access it directly on your site. Visitors to your site will appreciate you offering them help with planning their vacation. Setting this up takes just a few minutes - Click here for instructions.